GOVERNMENT lobbying by the Land & Building Developers Association (CLBDA) and the Land & Property Owners Association (KSIA) has been successful as proposals to reduce the tax on properties are now being discussed. Reducing the VAT to 5% for first-time home buyers for residences up to 250 square meters – and maintaining it at 15% for residences between 250 and 300 square metres. A suspension of property transfer fees for a three year period. A draft law concerning the reduction in VAT to 5% is expected to be discussed at today’s House Plenary session. The Island’s property market has been in trouble for quite some time. Sales have fallen for thirteen consecutive months and are now down by almost 20% on the numbers sold last year. Unemployment in the sector has risen and the business climate deteriorated. Assuming that these proposals are accepted by parliament and become law, they should go a long way in relieving the problems of the industry and should also help to clear the backlog of Title Deeds waiting to be issued. Thanks for your help Nigel, much appreciated! @Nicolas – I am afraid that the 5% VAT for first-time home buyers does not include ‘self-builds’. I wonder if someone could help & confirm for me that the 5% reduction in VAT for first time home buyers also applies to building your first house? Would that mean that our contractor would only apply 5% in our contract rather than 15%? Unless there is a clause in your contract of sale which obliges you to repay the Developer you may find, as my friend did, that the Tax Office refuses the request for a refund. Stating as he was not legally obliged to pay the developer, but that he had done so was good of him, but sorry no refund is payable to you. Once again Nigel, you’ve told me, and no doubt other readers, something I didn’t know. @Costas – the N.50 will show the value of the property when the Title Deed was last updated. It does not show the 1980 value of any buildings, etc. that have been added until the Title Deeds are re-issued. Each year, the registered owner of the property is required to submit a a Declaration of Immovable Property (IR 301 and IR 302) and pay the respective tax every year before 30 September. Let’s say for a project consisting of ten houses the developer starts off with a piece of land with a 1980 value of â‚¬60,000. When he starts building he must declare the amount of expense he has put into the land each year. Say he spends â‚¬750,000 on the site in the first year; this additional value will be assigned a 1980 value by the Inland Revenue department. For the sake of argument, letâ€™s say the Inland Revenue assign a value of â‚¬75,000, giving a new 1980 value of â‚¬135,000. In the second year he spends another â‚¬500,000 on the site and the Inland Revenue calculate the 1980 value of this at â‚¬50,000 and adds it to the â‚¬135,000 value calculated in year 1 giving a total 1980 value of â‚¬185,000. The developer has to pay IPT on the total assessed 1980 value of all the properties registered in his name. This will include the example above plus the value of other projects under construction, properties that he has completed for which Title Deeds have yet to be issued, plus any land banks he has – all the property that is registered in his name. A large development company will have properties registered in the name whose 1980 value could easily exceed â‚¬1,000,000. And the company will have to pay 0.8% each year on his total holding. Going back to the original example, in the second year he will pay IPT amounting to â‚¬1,480. What he should then do is apportion that â‚¬1,480 between the ten buyers who have bought on the development – and provide them with the necessary paperwork that will allow them to reclaim any overpayments they have made from the Inland Revenue department once Title Deeds have been issued and transferred into their names. I know it’s a crazy system – but it keeps civil servants employed. That’s very useful Nigel, thank you! As a result of submitting an N50 form to the District Lands Office, the document I received showed a 1980 value of less than 17,000 Euros for the whole development area on which there are approximately 30 properties built including my own. 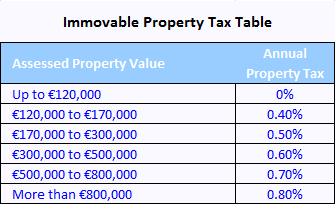 Is it this 1980 17,000 Euro value that any IPT is calculated on or are the IPT figures assessed against some other valuation? For more information, and to learn how to avoid being overcharged IPT by nefarious property developers, please refer to Cyprus Immovable Property Tax law. It’s interesting that there appears to be specific details about most of what the MPs agreed yesterday, but of course, no details at all about what ‘Changes to IPT’ means. No doubt it will mean we all end up paying even more, again! @Curmudgeon – It takes around 5 – 7 years after taking delivery to get Title Deeds issued. So if your developer applied for them to be issued in January, this is pretty good going. Parliament has yet to discuss the proposed suspension of Property Transfer Fees, so I can’t really comment on whether this will affect you until the legislation has been agreed and implemented. I suspect that the 5% VAT will not be retrospective and will only apply to future first-time home buyers. If you are permanently residing in Cyprus check out “Special Grant for Purchasing or Building a Residence, Law N.91(I)/2006” as you may be entitled to reclaim some of the VAT you have paid. As for good news for those without Title Deeds, the ‘Town Planning Amnesty’ will no doubt help some people to get their Title Deeds. But as your developer has already applied, this will not affect you. I’m a ‘first time buyer’ having purchased in good faith an off plan villa in 2006. It was completed (sort of) in October 2008 and I moved in May 2009. I’ve recently discovered my developer applied for my Title Deeds in January this year having lied about filing the application on numerous occasions over the preceding two years. So, I ask myself, what does this latest gambit mean to me. Will it help expedite my Title Deeds? Will I pay less or no IPT? Could I claim back the Vat difference? It took a nanosecond to decide there’s nothing in it for me but, I’ll bet my developer will find a way of pocketing something on my behalf. Now, any good news out there to cheer up existing owners without title? 1. The reduction in VAT for first time home buyers. 2. Changes to Immovable Property Tax. Opposition parties were reluctant to approve a VAT hike, saying it would affect lower income groups. Parliament will reconvene on September 15. I do not see the need for any of the current proposals & austerity measures because for the last few years the (former) finance minister has been informing us that Cyprus’ economy is strong; Cyprus has unique sets of circumstances and therefore will be unaffected by the global recession; Cyprus’ Banks are well capitalised; Cyprus’ developers are well capitalised and stronger than most in Europe. The Cyprus Real Estate market is very strong with Russian, Iranian and Israeli investors taking up more than the surplus created by the reductions in the British market; etc. etc. etc. Of course all the above may well be true if the Minister was including the occupied areas in his analyses as allegedly Israeli, Iranian, Russian and indeed other nationalities are investing heavily there but not in the Republic it seems, going by the proposals on the table. Were we being fed porkies do you think by someone as illustrious and in such high office as a finance minister or were his minions charged to advise him so far up developers back passages that they believed every syllable they were fed in press releases in spite of evidence to the contrary and advised their Minister accordingly? Oh what tangled webs are weaved when attempting to disguise the truth in the face of unquestionable reality. This is probably crossing a bridge before we really need to, but is this proposal suggesting that Title Deeds that are issued in the next 3 years to owners of existing properties that are without their Title Deeds will be free of Transfer tax? If so, it gets my vote straight away! Will a tax reduction to 5% and a suspension of property transfer tax be of any use if no one can sell their homes anyway in the absence of title deeds? Yet again we have more chat around the problem rather than solving it. The latter would be far to easy and more revenue productive. But hey this is Cyprus! I had heard that something was to happen regarding stimulation to the property market. By far the largest stimulus will be the suspension of the property transfer tax. This removes many thousands of Euros in costs of purchasing property. It is a great pity the government cannot see their way to ensuring a clear title deed is available at point of purchase. Instead they dance around the issue by allowing the purchaser to pay off the developer bank loan to achieve a still flawed solution. The buyer remains hostage to claims by the tax authorities & others. However, something is better than nothing, if it is properly designed. As property transfer tax was a large earner for the government, I cannot help but worry how this lost revenue will be replaced. Hopefully most of the necessary income will come from savings in government spending, rather than increased taxes.